Inspired by Gnome's Oh no more hand-picked free games I decided to create the mother load of free games. A List that contains every single free game that is worth playing. I'm absolutely sure that my initial list will miss many games but it will grow over time - with your help. I know that you have an ace up your sleeve and will help me create the list. For now, enjoy what we have collected so far and add any valuable entry in the comments. I will take a look and add it to the list. I decided to create a few categories which makes it easier to take a look at the list. Please note that I did not include so called Abondonware in the list. You might need Dos Box to run some of the games in windows. Note: We are updating the list regularly with new games and remove games that are no longer available from it. Only games that meet our quality guidelines are added to the list. We would like to point out that we are not adding browser games, only desktop games that you can run on Windows PCs. Afterburner 3d - A remake of the classic Sega Arcade shooter. Alien Breed Remake - A remake of the classic Amiga shooter. America's Army - Created for the US Army, multiplayer shooter. Battlecruiser Millenium - A space simulation. Beats of Rage - A Streets of Rage remake. Cave Story - Classic Japanese sidescroller. Counterstrike 2d - A 2D conversion of the popular Counter-Strike game. Double Dragon Forever - Classic Beat'em up. Fear Combat - The multiplayer part of the award winning Fear. Frets on Fire - A music game in the style of Guitar Hero. Full Spectrum Warrior -- Command and coordinate infantry squads in a warzone. Grand Theft Auto 1 - A Rockstar game, enough said. Grand Theft Auto 2 - Better graphics than 1, similar gameplay. Hidden and Dangerous Deluxe - Look still nice and plays great. Mono - one of the greatest addicting games I've ever played. New Super Mario Forever - Another Super Mario fan remake. One Must Fall - A beat'em up. Penumbra - A 3d horror game, like Silent Hill or Resident Evil. Retro River Raid - Remake of the Atari 2600 classic. Secret Maryo Chronicles - Mario Brothers Game like Super Mario Brothers. Silver Wings - a classic shoot'em up. Stepmania - A dance and rhythm game for PC. Super Mario Bros X - A fan made Super Mario game. SWIV - inofficial follow up of the Amiga game Silkworm. 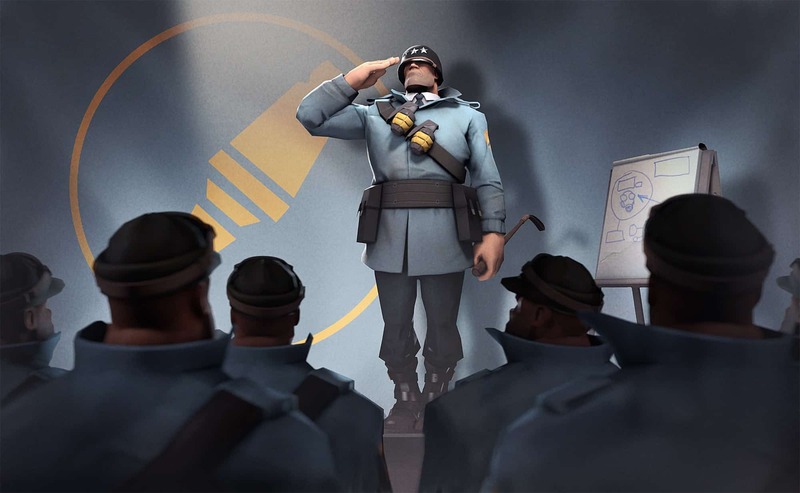 Team Fortress 2 - Probably the best shooter that has been released in the last couple of years. Tremulous - standalone Quake 3 mod. Marines vs Alien spiders. Tribes - Was a great multiplayer shooter. Trilby the art of theft - A stealth platform game. Ultrastar Deluxe - An Open Source Singstar alternative. Warsow - First Person Shooter. Wild Metal - a 3d strategic combat game. Wing Commander Privateer Remake - A great remake of privateer. Wing Commander Saga: The Darkest Dawn -- A fan remake that plays in the popular Wing Commander universe. Wolfenstein Enemy Territory - A great online shooter, play either the German or allied side and choose a class to play. Xenon 2000 - Xenon was a famous shoot'em up on the Amiga created by the famous Bitmap Brothers. They created a update to that classic game. Beneath a Steel Sky - What a great adventure, link to the free cd version. By Revolution who created the famous Broken Sword Adventures as well. Flight of the Amazon Queen - Looks and plays like Lucasarts classic adventures. Head over Heels - Classic Adventure Game from 1987. King's Quest 1 - King's Quest 1 VGA remake. King's Quest 2 - King's Quest 2 in VGA, great remake. King's Quest 3 - A remade VGA version of King's Quest 3. Lure of the Temptress - old adventure but still great to play. 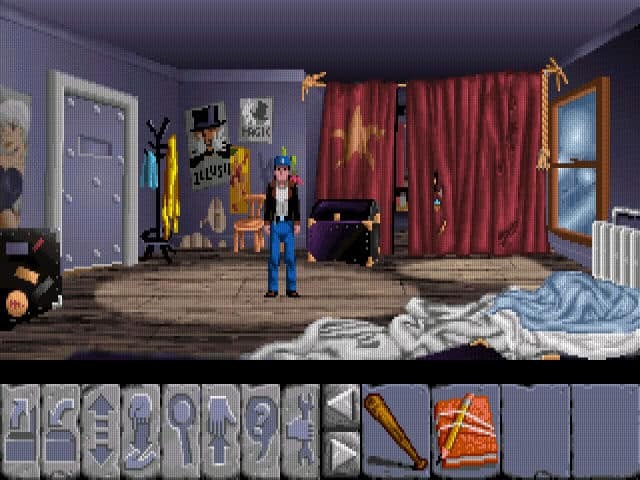 Maniac Mansion Deluxe - Well, Maniac Mansion, the first Lucasarts adventure, do I have to say more. Quest for Glory II -- Another remake of a classic Sierra OnLine game. Space Quest Chapter 0 - Uses the same interface as Space Quest 1 and 2. Zak MC Kracken 2 - part 2 of the classic Lucasarts Adventure. Betrayal at Krondor - A rpg taking place in the worlds of Raymond E. Feist. Dwarf Fortress - rogue-like RPG with city building feature. The Elder Scrolls Arena - I loved that game. It was terribly buggy but I still loved it when it first came out. Oblivion is the latest part in this series from Bethesda. 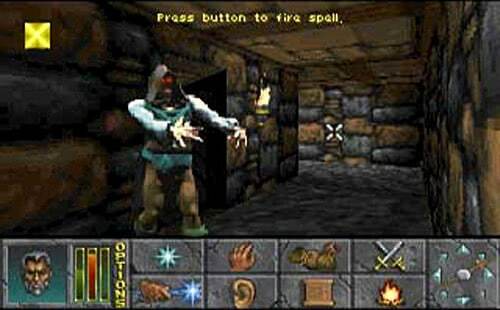 The Elder Scrolls Daggerfall - The second part of The Elder Scrolls sage. Ultima IV - It's Ultima ! Zelda Classic - A classic remake of Zelda by Nintendo. Fantasy Tennis - A sports game like Mario Tennis. Future Pinball - Great free pinball game. Little Fighters - A free PC fighting game. Neverball - A minigolf game. Trackmania Nations - A free multiplayer racing game. 123 Free Solitaire - A solitaire card game pack. Advanced Strategic Command - Like Battle Isle. 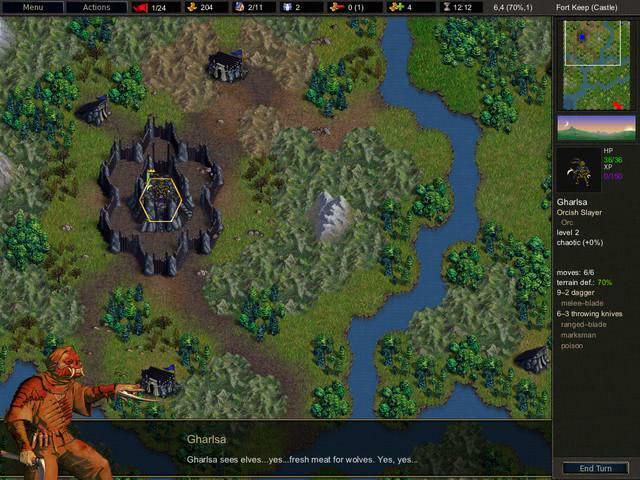 Battle For Wesnoth - A game like Shining Force and Final Fantasy Tactics. Great ! Blocksum - A fast paced puzzle game. Castle Combat - Build a fortress and destroy the enemies one with your cannons. Civ Evolution - A free Civilization clone. FreeCiv - Just like Civ Evolution a free Civilization clone. FreeRails - Railroad Tycoon Remake. L General - A Panzer General Clone. Open TTD - A transport tycoon deluxe open source conversion. Rise & Fall: Civilizations at War -- A real-time strategy game playing in ancient times with a first-person component. Settlers 3d - A 3d adaption of the boardgame Settlers of Catan. Steel Panthers Battle Tank - Turn based strategy game like Panzer General. Steel Panthers World at War - Another Steel Panthers game. Swine - A classic RTS game. The Ultimate Free Games List is a big collection of commercial games released for free, and remakes of commercial games that are available for free. Tremulous (http://tremulous.net/) – standalone Quake 3 mod. Marines vs Alien spiders. Try http://freegameslist.weebly.com/ it has a small list of games but they’re pretty good. Great little resource….will pass on article. A mini golf game. Needs no installation, light, but really great ! Just type Winigolf on a search engine to find it. All i wanted was Zak McKracken 2….but the-underdogs is not only gone, its an ad-sink!! Now my day is doubly ruined…hehe..except for the fact that I know that there’s a Zak McKracken 2!! I certainly have to bookmark this page. I need to play some RPGs. Have not played a decent one for ages. Game was developed commercially in 96, then went free shortly after. The 2006 edition of Another World isn’t free. It lets you play one measly level, then urges you to pay EUR 7,- to continue. Check out the excellent freeware Star Wars space battle games Battle of Yavin and Battle of Endor at http://www.bruneras.com/. Why isn’t this updated? From ghack.net itself, Bang Howdy isn’t even included! :/ Nice list so far though! Don’t forget the fps Dinohunters! Free Massive multi-player RPG, Live moderated chat suitable for all ages, Come cast spells and wield powerful weapons against 400+ monsters… and each other. Play our new Monster Bingo or participate in our new Mining update.Join a clan or play alone, strive to be the best and obtain the Ultimate Dominion. No downloads required, and it costs absolutely nothing. So hop on your dragon and fly on over and check us out. It’s called BATTLE FREE and I’ve played it a few times. It’s pretty fun. It’s very close to a one of a kind. There is a new browser-based Strategy/MMO just up. It is an all PVP game, where you build up / train / equip an army and send it to pillage your foes. It is currently in open beta right now, and is accepting players. Basically, it’s a text-based browser game. It’s all PVP. You get some citizens everyday, you can put them to work as: Miner, Soldier, Guard. You can equip your army with different weapons and armor. You can also supplement your main army with Hellpigs( they are not equippable, and are worth a set att/def value) they are cheap but die easily in combat. You also have a set of skills that you can upgrade, these will either upgrade your attack/defense, upgrade the amount of citizens you get on a daily basis, etc. x-fire web game detection is set up. There is also a referral – reward system, where you can get free in-game cash and citizens for referring your friends to play. It’s a great time-waster. You can get online and play for about 10-15 mins, about twice daily and keep up with the rest of the players. We have added a bunch of new features to our game and would like to add a new incentive to players to join our beta test. We will now give all new players a “New Player Gift Pack” that contains over $5 worth of Cash Shop items. All new players will receive: 2 Sapphires, 1 Xp Booster, 1 Attack Booster and 1 Defense Booster. We are also running a “Mini Gift Box” event all week. With each battle victory you have a chance of getting a free Mini Gift Box. Thanks for your support and we hope to see you online soon! I have been searching for a list like this for ages. Does it say something about my searching abilities that I found it on the site where I have been contributing for about 15 months? Afterburner rocked for the Sega console!! I completely forgot about that one, it brings back some fun memories! Blog agradable, finalmente encontr� que el Info que buscaba. Thank you for a great piece of work. Could you please add to the list description if a game is playable in a single player mode or not. Meaning no Multiply mode is necessary. That is very helpful in case no internet is available on a gaming PC. Hi nice list. I tries simcity but it keeps telling me error on page when i try to start the game!! Any advise? well you all should try them to have good time. anyone suggest me more games please lol..
Hey all! I’m an intern at WildTangent and we’re giving away a free full download of Fate if you like our Facebook page before June 14th. Follow this link and it’ll take you to our page, then to the Facebook page. Happy gaming! Please add this free space strategy game to the list. It’s a massive multiplayer, space themed, empire building/resource management game. Thanks for all these game links. Always looking for more games. I tried Battle for Wesnoth and I love it.